Vince Briel of Briel Computers has announced that he’s taking pre-orders for his new 3-slot expansion interface board for Apple I and Replica 1 computers. 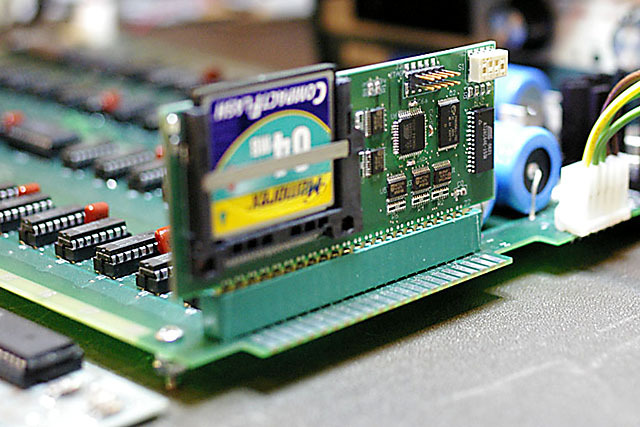 The expansion board is connected to the Replica 1 via a standard 40 pin IDE cable, making it possible to add the Apple Cassette Interface, and exciting new devices such as Rich Dreher’s CFFA1 card (currently in testing). Kits will be $44.95 and assembled boards $54.95 USD, plus shipping. In related news, Vince has developed a PS/2 encoder board for the Apple II and II Plus, to replace failed keyboard encoder boards. He’s also working on an adapter board that convert a standard Apple //e keyboard into an ASCII keyboard so that people who need ASCII don’t have to scrap a II Plus to get one. If either of these projects interest you, be sure to let Vince know. This entry is filed under Apple 1, Hardware. You can follow any responses to this entry through the RSS 2.0 feed. Both comments and pings are currently closed.